Is MOQC a Michigan Medicine initiative? MOQC is not a Michigan Medicine Initiative. MOQC’s Coordinating Center team is physically located at the University of Michigan. This is the result of the University of Michigan Comprehensive Cancer Center initially proposing to establish the oncology collaborative with BCBSM. Because of this relationship, MOQC is allowed access to Michigan Medicine’s infrastructure (e.g. space, IT). However, MOQC approaches and interacts with the Michigan Medicine’s Comprehensive Cancer Center in the same way it approaches and interacts with any MOQC oncology practice. What is the Coordinating Center? The Coordinating Center is a small group of people that are paid by BCBSM but who are employed to engage with all oncology practices across the state of Michigan to improve the quality of care. The size and make-up of the team of people is dependent on the needs of the practices that it serves. The team is led by Dr. Jennifer J. Griggs, a practicing medical oncologist, and is supported full time by a program manager who is a nurse with thirty years of healthcare experiences and two master’s degrees. You can find the rest of the team on our website at the TEAM page. Who makes the decisions regarding MOQC? Dr. Jennifer Griggs and Louise Bedard manage the day-to-day functions of MOQC. However, strategic and operational decisions that set direction, deploy resources, or require the review of quality data to set the focus of the Coordinating team are made in conjunction with our Steering Committee. The Steering Committee is an inter-disciplinary group of physicians and other health care professionals, including social workers, pharmacists, and nursing professionals, as well as patient advocates, from across the State of Michigan representing a cross section of oncology practices. MOQC also welcomes feedback and ideas from practices. This is your Consortium and we strive to ensure that the work we do for you is meaningful and relevant to the care you provide to your patients. Does MOQC work for BCBSM? MOQC is a BCBSM Collaborative Quality Initiative (CQI). All of MOQC’s financial support is provided by BCBSM. CQIs are partnerships between BCBSM, participating hospitals, physicians and a coordinating center team that leads the program. Practices share data to develop best practices around areas of care with high costs and high variation. Blue Cross never sees individual practice or physician data. However, the coordinating center uses data collected to identify opportunities for improvement. BCBSM allows the Coordinating team and its physician-led Steering Committees to drive the goals and areas of performance improvement. Quality improvement work benefits all patients regardless of insurance coverage. BCBSM believes that if quality is improved, costs will decrease and its members will benefit. What is Dr. Griggs’ background? Jennifer J Griggs, MD, MPH is a professor and a practicing medical oncologist. Her specialty is breast cancer, and she sees patients every week at Michigan Medicine, Comprehensive Cancer Center (UMCCC). Prior to her appointment at Michigan Medicine, she managed a panel of 1200 patients at the University of Rochester, where she saw as many as 30-40 patients a day. In addition to her clinical work, Dr. Griggs provides leadership to MOQC and its practices with the goal of lifting the quality of oncology care across the state of Michigan. She mentors oncology fellows at University of Michigan and rotates through the inpatient oncology consult service at Michigan Medicine. She also leads research teams and publishes prolifically in the area of health disparities in cancer. She speaks regularly at academic and community events regarding the quality of cancer care and disparities in care according to race, ethnicity, patient-provider communication, end-of-life care, and global medicine. She mentors developing investigators who specialize in a variety of malignancies, including colorectal cancer, prostate cancer, thyroid cancer, chronic lymphocytic leukemia, head and neck cancer, and in end-of-life care. 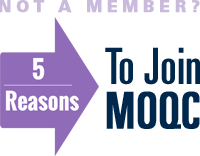 Why should any PGIP Oncology Practice participate in MOQC? ASCO’s Quality Oncology Practice Initiative (QOPI®) is an oncologist-led, practice-based quality assessment program designed to promote excellence in cancer care by helping practices create a culture of self-examination and improvement. QOPI provides a standard methodology, robust library of quality metrics for oncology, and a collection tool to reliably and routinely assess care, inform quality improvement activities, and demonstrate quality to patients and external stakeholders. Early adopters of QOPI are well-positioned to meet external reporting requirements for payers and the government and participate in new payment models focused on quality. To participate in MOQC, is it required to participate in QOPI? Yes. To be in MOQC, a practice must abstract QOPI measures per direction from MOQC. MOQC communicates which measures and/or which rounds to participate in abstraction. MOQC aggregates all practice data and presents to its Steering Committee. This data, along with feedback from the practices, is used to determine how Coordinating Center resources are used to develop practice resources to improve quality. Click here to learn more about the MOQC Steering Committee. Does MOQC support practices in achieving QOPI certification? After calendar year 2017, MOQC will not provide support for QOPI certification. If a practice wishes to pursue certification, please contact QOPI certification directly at qopicertification@asco.org or call 517-483-1669. To learn more about QOPI certification and the advantages of the program, click here. The Medicare Access and CHIP Reauthorization Act of 2015 (MACRA) ended the Sustainable Growth Rate (SGR) formula, which threatened clinicians participating in Medicare with potential payment cliffs for 13 years. MACRA legislation addresses rising medical costs by putting programs into place through Medicare that will financially reward physicians that provide care that is of higher quality and lower cost than the national average. Conversely, this program will penalize physicians whose care is of lower quality and higher cost than average. Collectively, these programs are called the Quality Payment Program or QPP. Both programs reward high quality, lower cost care, but are different. If an oncologist participates in an Advanced APM, through Medicare Part B, he or she may earn an incentive payment for participating in an innovative payment model. If an oncologist participates in MIPS, he or she will earn a performance-based payment adjustment. Participation in MOQC will allow a practice to meet the requires set forth in MIPS. MIPS stands for Merit-based Incentive Payment System (MIPS) and is a Medicare program. Physicians will earn a payment adjustment from Medicare based on evidence-based and practice-specific quality data. Physicians will send individual data for each of the MIPS categories through an electronic health record, registry, or a qualified clinical data registry (QCDR). A physician may also choose to send in quality data through routine Medicare claims process. Based on this data, physicians will receive a composite quality score. Each of these group will contribute a certain percentage to the overall composite score. Whether a physician’s score compares favorably or unfavorably to the national average determines whether doctors receive either a bonus on top of their usual FFS reimbursements, a penalty, or a “neutral” reimbursement. Physicians will collect data in 2017 and submit data in 2018. The first reimbursements under MACRA will arrive in 2019, based on this data timeline. Medicare will begin using the cost category to determine payment adjustments in 2018. Scores will be publicly available on the CMS Physician-Compare website at that time. A physician can participate in MIPS as an individual or as part of a group. Many oncology practices have been involved in submitting quality information to CMS through the PQRS program. However, there are important differences between the retired PQRS program and MQCRA’s Quality Category. Under MACRA’s Quality Category, which accounts for 60% of the composite score for 2017, practices will have to select six quality measures (as opposed to nine in PQRS) to report annually, including one cross-cutting measure (a measure that are broadly applicable to many clinical settings and specialties) and one outcome measure. Any oncology practice will be positioned to meet 75% (quality and improvement activities) of CMS’ MIPS program or components of an APM model if they actively participate in MOQC. QOPI provides a standard methodology, robust library of quality metrics for oncology, and a collection tool to reliably and routinely assess care, inform quality improvement activities, and demonstrate quality to patients and external stakeholders.